NOTE: “Safe Space” is a fairly new term which typically refers to areas on university campuses where perceived bigotry toward victim groups, harassment or disagreement about politics is not tolerated. While advocates laud safe spaces as sanctuaries for those who are discriminated against, critics have argued they promote anti-intellectual attitudes and stifle free speech. 1. What device does the cartoonist use to highlight this trend on college campuses? 2. Which statement do you think best describes the cartoonist’s intended meaning? Explain your answer. b) Under their new regime of safe spaces, trigger warnings, and the right to not be offended, the intolerant have eliminated free thinking, logic, debate, dissent and open inquiry on college campuses. 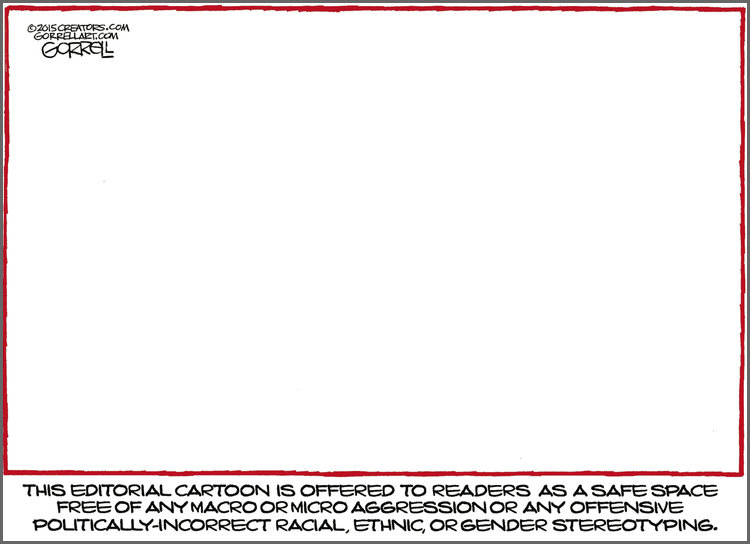 c) The only way editorial cartoonists can protect themselves from the rage of offended college students is to draw blank cartoons. In response to recent student protests at the University of Missouri, the University Police Department (MUPD) is asking “individuals who witness incidents of hateful and/or hurtful speech” to call the police immediately and photograph the individuals involved, allowing the university to “take disciplinary action” against offending students. Christakis, defended his wife’s comments. Many students angrily confronted him and are now demanding both Christakis and his wife resign. 1. b) sarcasm: A form of verbal (or visual) irony in which it is obvious from context and tone that the speaker means the opposite of what he or she says.